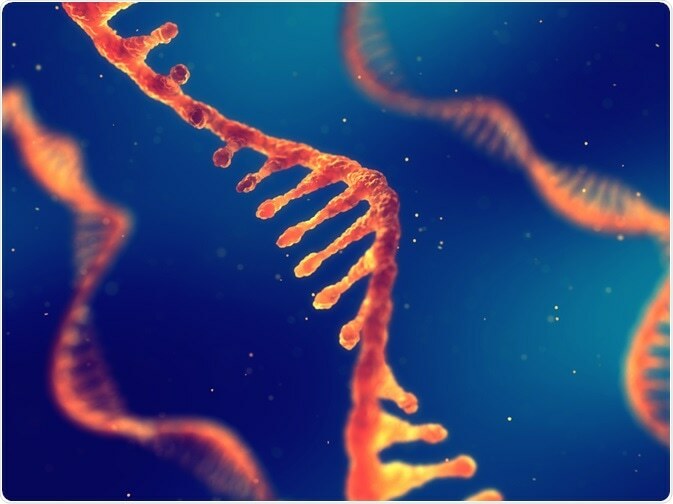 MicroRNAs (miRNAs), ultra-short non-coding RNA, which regulate gene expression, can be used as biomarkers to monitor diseases of the immune system. miRNAs are found in cells and are also stable in extracellular fluids such as plasma. As they are stable in biofluids and can be identified non-invasively, circulating miRNAs are good biomarker targets for diseased states, including those of the immune system. The immune system plays an important role in protecting the body and preparing other cells in the event of infection. As part of this function, the immune system secretes substances into extracellular space to signal to other cells. One of these mechanisms involves the secretion of miRNA-containing exosomes by lymphocytes. The miRNAs contained within the circulating exosomes can be used as serum biomarkers to analyze the health of the immune response. Recent research has shown that miRNAs are perfect biomarkers for immune system diseases. For example, following activation of lymphocytes the volume of miRNA miR-150 in the serum increases in flu vaccinated humans. This research (de Candia et al., 2013) is evidence that circulating miRNAs can be used as biomarkers for vaccinations and adaptive immune responses. The research by Candia et al. found a signature of 17 miRNA’s which were released in exosomes by CD4+ T-cells and that increased levels of miR-150 correlated with antibody responses following vaccination. As the level of miR-150 in extracellular exosomes increased, intracellular levels decreased because of the excretion. Research by Duroux-Richard et al. (2014) also demonstrates that circulating miRNA profiles can be used to identify dysfunction of the immune system. Their research showed that the level of miR-126b was significantly higher in patients suffering from rheumatoid arthritis (RA) and other types of inflammatory arthritis. Higher levels of miRNA were also shown to correlate with a good clinical response to rituximab treatment several months later. This prediction of a good response to rituximab worked beyond RA patients and also worked for patients treated with rituximab for B lymphomas. This means that miR-126b could be used as a biomarker to indicate therapeutic response. Recent research by Krissansen (2015) used miRNA microarray analysis to examine serum miRNA expression with different diseases including rheumatoid arthritis (RA), ulcerative colitis (UC), Crohn's disease (CD) and inflammatory bowel diseases. They found that for patients with RA, UC and CD miR-595 and miR-1246 were upregulated compared to healthy controls. miR-595 targets molecule-1, for neural cell adhesion, and growth factor receptor 2 on fibroblasts (both of which maintain tight junctions) to impair epithelial tight junctions – whereas miR-1246 assists the activating a proinflammatory nuclear factor found in T cells. Both mechanisms are targets for the treatment of bowel diseases such as IBS. Identifying signatures of circulating miRNAs could be used for immune system diagnostics and to understand the activation and dysfunction of the immune system. miRNAs, due to their presence in plasma and biofluids, can be easily measured and are a strong candidate as immune disease biomarkers. Abcam has developed a panel for the analysis of 68 miRNAs (from the literature) for immunology research. The miRNAs selected are regulated in immune system diseases such as Leukemia, Hodkin’s Lymphoma, and Multiple Myeloma. Using a pre-designed panel allows researchers to begin their research immediately, with high sensitivity miRNA profiling direct from either purified RNA samples or crude biofluids. Montani F, Marzi MT, Dezi F, Dama E, Carletti RM, Bonizzi G, Bertolotti R, Bellomi M, Rampinelli C, Maisonneuve P, Spaggiari L, Veronesi G, Nicassio F, Di Fiore PP, Bianchi F (2015). miR-Test: A blood test for lung cancer early detection. J Natl Cancer Inst 107, djv063. Schwarzenbach H, Nishida N, Calin GA, Pantel K. Clinical relevance of circulating cell-free microRNAs in cancer (2014). Nat Rev Clin Oncol 11, 145–156. Shin VY, Siu JM, Cheuk I, Ng EK, Kwong A (2015). Circulating cell-free miRNAs as biomarker for triple-negative breast cancer. Br J Cancer 112,1751–1759. Singh PK, Preus L, Hu Q, Yan L, Long MD, Morrison CD, Nesline M, Johnson CS, Koochekpour S, Kohli M, Liu S, Trump DL, Sucheston-Campbell LE, Campbell MJ (2014). Serum microRNA expression patterns that predict early treatment failure in prostate cancer patients. Oncotarget 5, 824–840. Wozniak MB, Scelo G, Muller DC, Mukeria A, Zaridze D, Brennan P (2015). Circulating microRNAs as non-invasive biomarkers for early detection of non-small cell lung cancer. PLoS One 10, e0125026.